Mexico's state-owned oil company Pemex has announced it will stop shipping ready-to-use petrol and diesel through its pipelines, in an effort to curb fuel thefts. 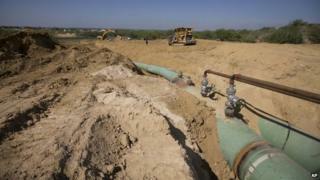 Pemex says it will use its pipelines across Mexico only for unfinished fuel. That fuel will go through a last phase of mixing when it reaches the company's storage plants. More than $1bn (£650,000) worth of fuel was stolen by Mexican gangs in 2014, an increase of 70% over the previous year. In a statement, the company warned consumers not to buy illegal fuel tapped from its pipelines as it was likely to damage car engines. Last year, Pemex discovered more than 2,600 illegal taps along its network of ducts. Many criminal organisations, including Mexico's notorious drugs gangs, are involved in the illegal activities. Mexican oil production has declined from 3.6 million barrels a day in 2004 to just 2.5 million. Pemex, known officially as Petroleos Mexicanos, has been in the red since 2013. Last year, the Mexican Congress approved President Enrique Pena Nieto's energy reform, one of the priorities of his administration. The constitutional changes have allowed foreign companies to be awarded oil contracts for the first time since the industry was nationalised in 1938.